Property rights and "Russia" do not usually belong in the same sentence. Rather, our general image of the nation is of insecurity of private ownership and defenselessness in the face of the state. Many scholars have attributed Russia's long-term development problems to a failure to advance property rights for the modern age and blamed Russian intellectuals for their indifference to the issues of ownership. 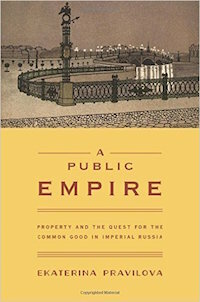 A Public Empire refutes this widely shared conventional wisdom and analyzes the emergence of Russian property regimes from the time of Catherine the Great through World War I and the revolutions of 1917. Most importantly, A Public Empire shows the emergence of the new practices of owning "public things" in imperial Russia and the attempts of Russian intellectuals to reconcile the security of property with the ideals of the common good. The book analyzes how the belief that certain objects—rivers, forests, minerals, historical monuments, icons, and Russian literary classics—should accede to some kind of public status developed in Russia in the mid-nineteenth century. Professional experts and liberal politicians advocated for a property reform that aimed at exempting public things from private ownership, while the tsars and the imperial government employed the rhetoric of protecting the sanctity of private property and resisted attempts at its limitation. Exploring the Russian ways of thinking about property, A Public Empire looks at problems of state reform and the formation of civil society, which, as the book argues, should be rethought as a process of constructing "the public" through the reform of property rights.